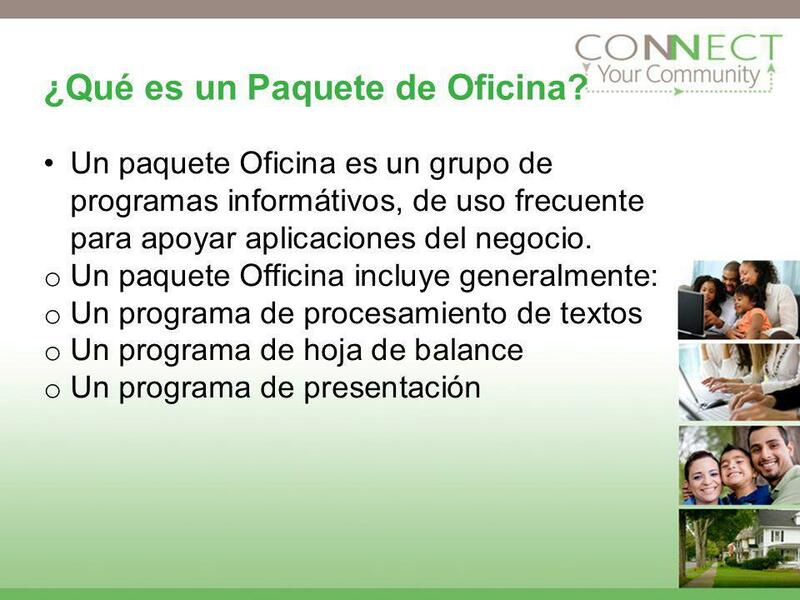 2 ¿Qué es un Paquete de Oficina? Un paquete Oficina es un grupo de programas informátivos, de uso frecuente para apoyar aplicaciones del negocio. 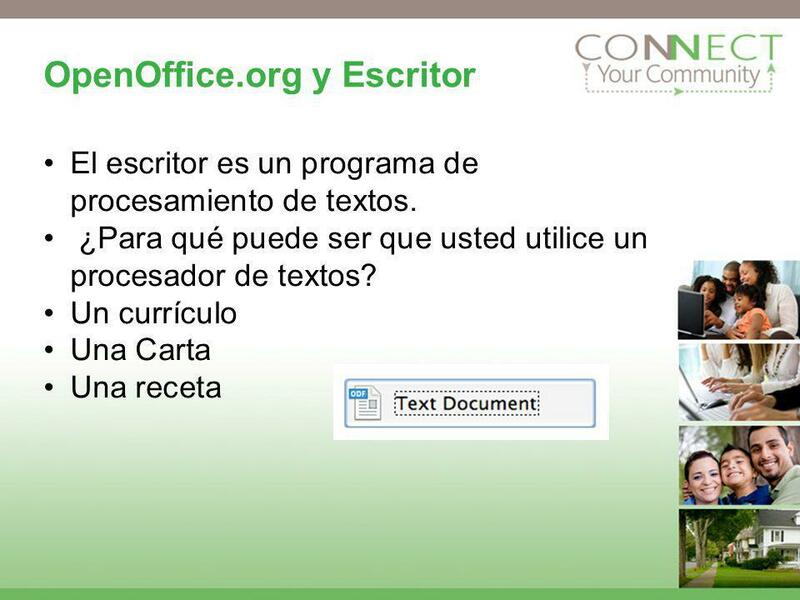 Un paquete Officina incluye generalmente: Un programa de procesamiento de textos Un programa de hoja de balance Un programa de presentación Insructor: This is review for students, ask them what word processor, spreadsheet, and presentation they learned from MS Office. 3 ¿Qué es OpenOffice.org OpenOffice.org 3 es la habitación de software principal de la oficina para abrir- fuente. Puede leer y escribir archivos de otros paquetes de programas informáticos comunes de la oficina. Puede ser transferida y ser utilizada totalmente gratuitamente para cualquier propósito. Instructor: Talk to students about what Open source means. Open source is any product where you have access to the end product's source materials. In other words, you have access to how it was made. Think of it in food terms. The recipe for Coke or for KFC original recipe chicken is a secret. No one knows what the recipe, or source materials- are. This is how Microsoft Office works. People don’t have access to how it’s made. Open Office however, is open source - everyone has access to how it’s made. If Coke went “open Source,” they would publish the recipe for coke. So you could still buy coke off the shelf, but now you would also know how to make it at home. Think of the Nestle Toll House Cookie recipe. It is available to anyone. You make the cookies and change the recipe as you like. In software, Open Source allows people to change the source code (like the recipe) to fit their particular needs. El escritor es un programa de procesamiento de textos. ¿Para qué puede ser que usted utilice un procesador de textos? 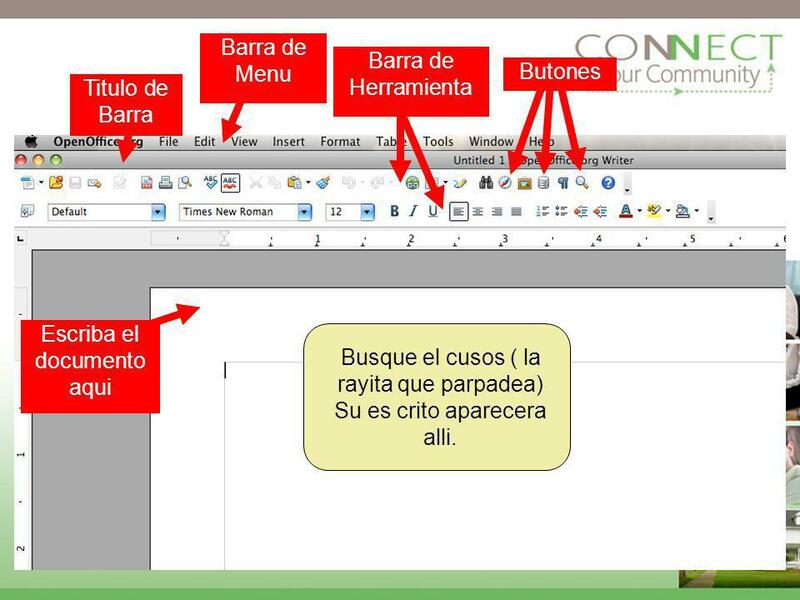 Un currículo Una Carta Una receta Instructor: Ask the class to name more examples of something you might use a word processor for. This is review material. Ask the students if they remember what the word processor within MS Office is. Answer: Word. 5 Habra Open Writer Ahora. 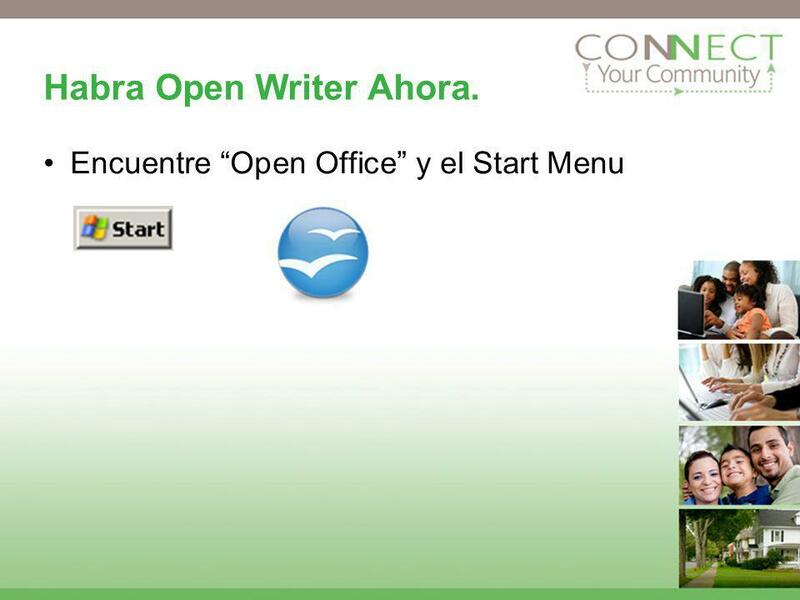 Encuentre “Open Office” y el Start Menu Insructor: Let students know there are multiple ways to open writer. Review the other ways to open a program (desktop shortcut, or existing document). Barra de Menu Barra de Herramienta Butones Titulo de Barra Escriba el documento aqui Busque el cusos ( la rayita que parpadea) Su es crito aparecera alli. Instructor - walk through each piece of the illustration for students - Note that It is very similar to what they saw in Word. Title Bar - shows the document title and program Menu Bar - Shows all of your menu options for a program Toolbars - Contain shortcuts to commands used for formatting and adding elements to a document Buttons - are specific shortcuts to format or add elements Instructor: Ask students to practice typing something in the white space. Cambie la fuente usando el atajo en la barra de herramientas. Instructor: Encourage students to change the font of what they just typed. Again, emphasize the similarity to MS Word. 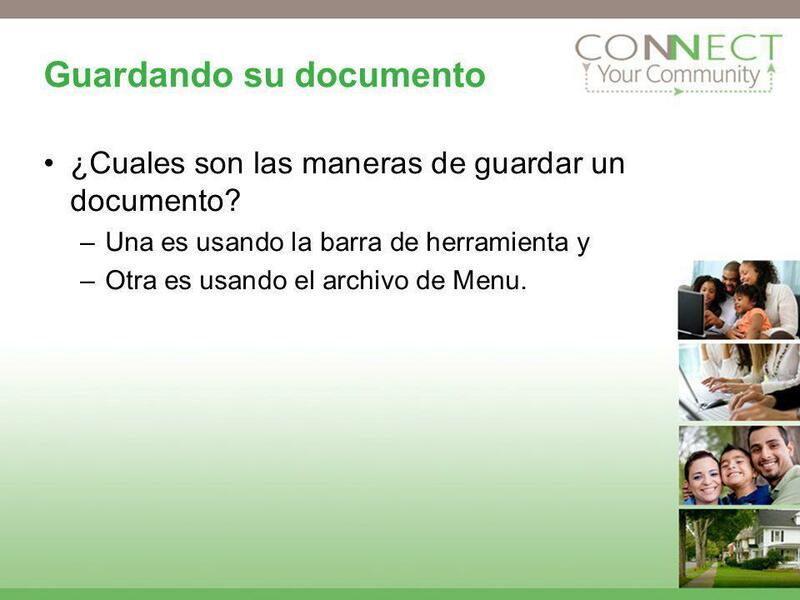 ¿Cuales son las maneras de guardar un documento? Una es usando la barra de herramienta y Otra es usando el archivo de Menu. Instructor - Review Save versus Save as from the previous module. Use Save As when your are saving your file to a new place or when you are saving your file under a new name. Use Save when you have made a change to your document. Instructor - review using the file menu versus the toolbar to save. 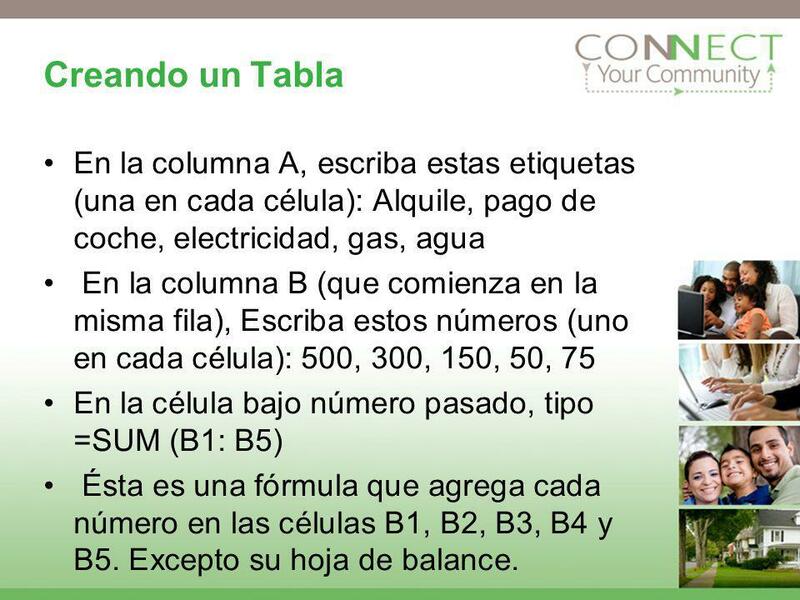 ¿Para qué puede ser que usted utilice una hoja de balance? 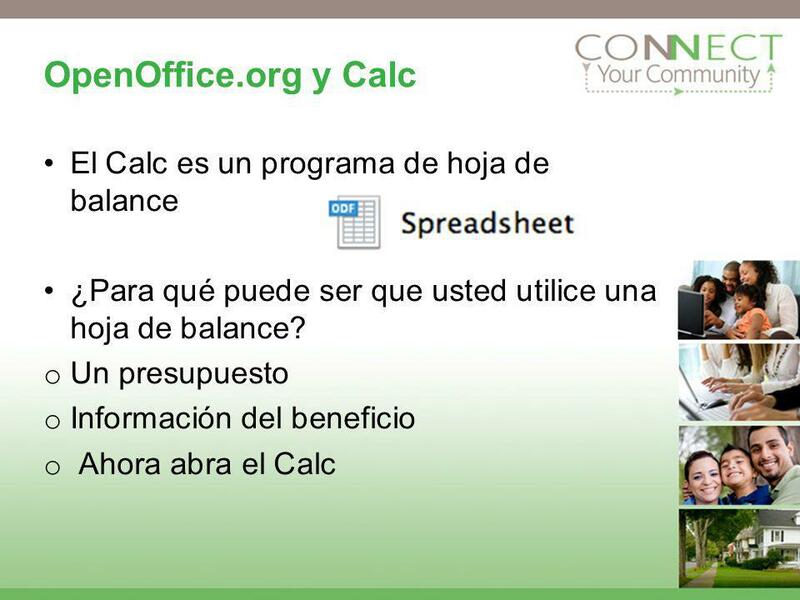 Un presupuesto Información del beneficio Ahora abra el Calc Instructor: Ask the class to name more examples of something you might use a spreadsheet for. This is review material. 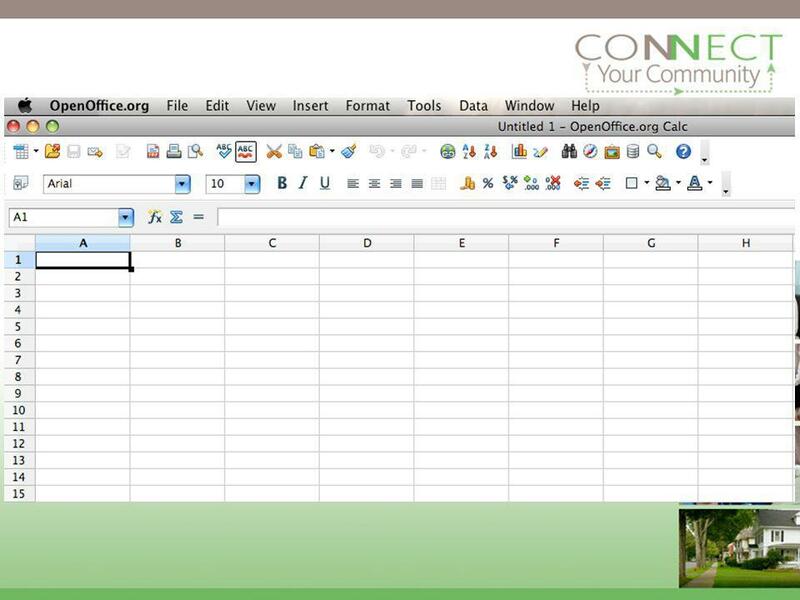 Ask the students if they remember what the spreadsheet within MS Office is. Answer: Excel. Impresion es un programa de la presentación. 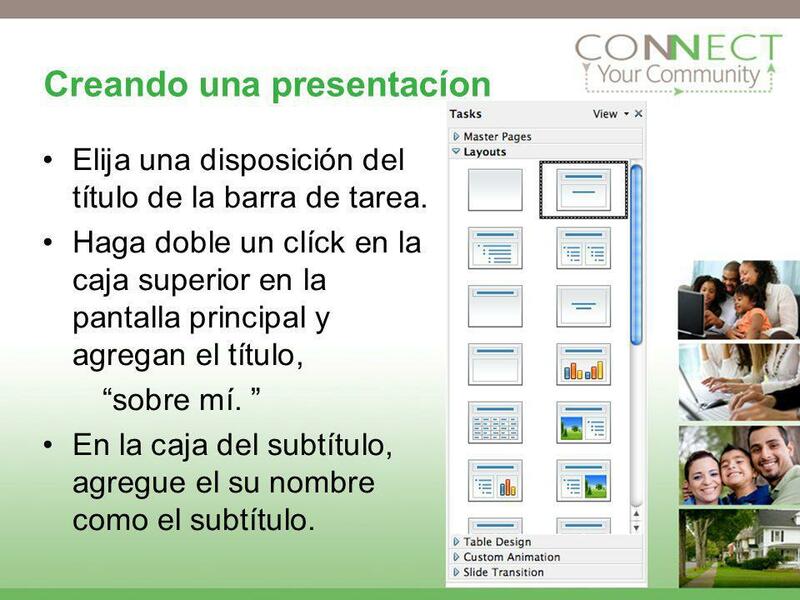 ¿Para qué puede ser que usted utilice una presentación? Una presentación de ventas Una demostración de diapositiva del cuadro Abierto ahora impresione Instructor: Review presentation software and uses. Ask class what element of MS Office is equivalent to Impress. Answer: PowerPoint. 13 Instructor: Ask students to point out similar features here that are found in Writer and Calc, like the tabs, buttons, title bar. Elija una disposición del título de la barra de tarea. Haga doble un clíck en la caja superior en la pantalla principal y agregan el título, “sobre mí. ” En la caja del subtítulo, agregue el su nombre como el subtítulo. Help students walk through these steps. Haga un clic en el nuevo botón de la diapositiva para agregar una nueva diapositiva. Titule la diapositiva, “mis alimentos preferidos” y agregue a sus favoritos como artículos baleado. Agregue 1 más diapositiva de sus demostraciones de TV ó del su favorito. Help students walk through these steps. 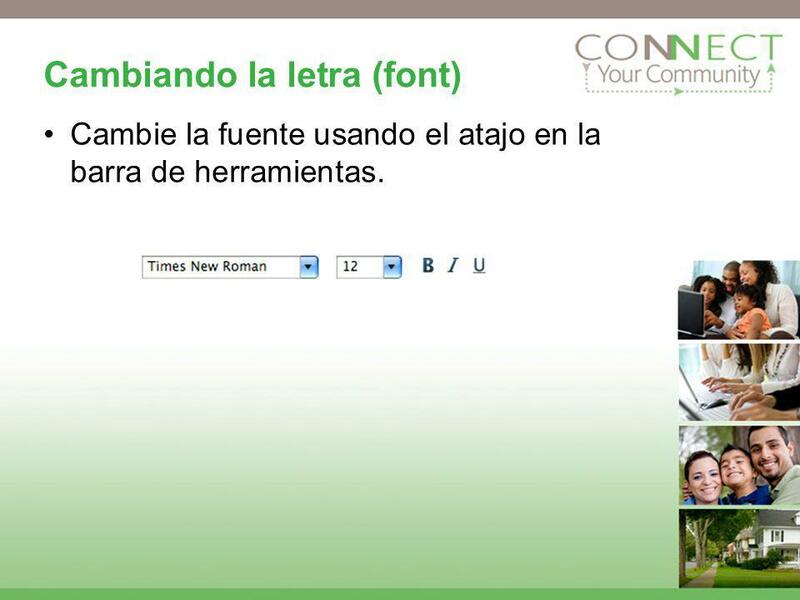 On inserting a new slide, encourage students to select the standard title + bullets format, but mention that other templates can be used for other uses. 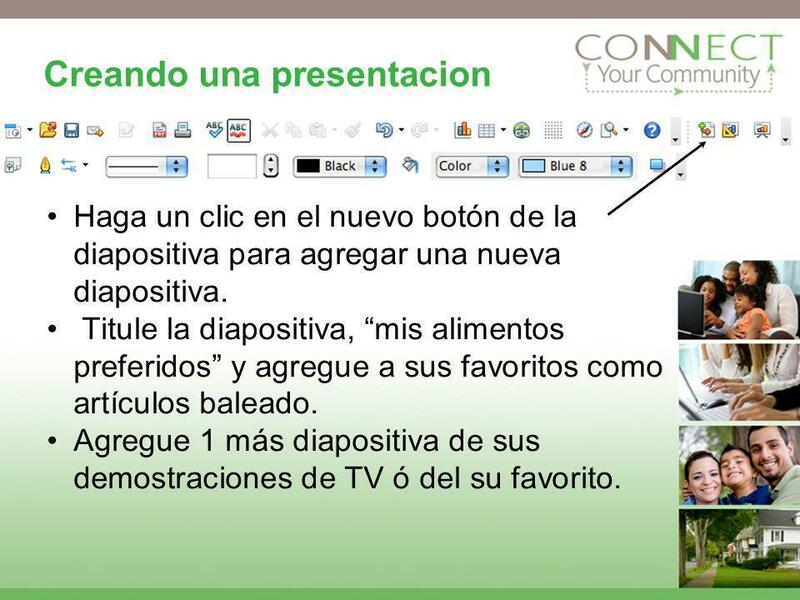 Haga un clic en el botón del slideshow para exponer su presentación. Presione las flechas delanteras para avanzar sus diapositivas. Cuando le hacen, practique el ahorrar de su presentación. Instructor: Have students show their presentation to someone sitting nearby. 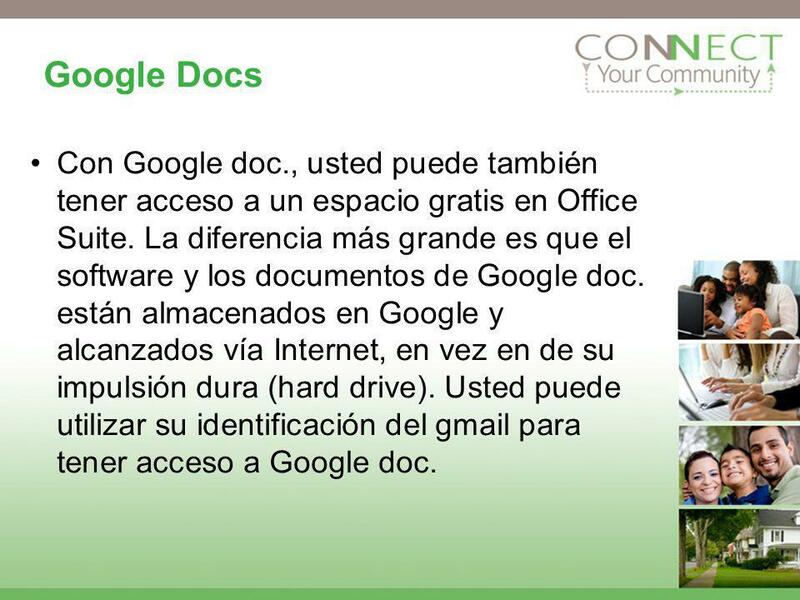 17 Google Docs Con Google doc., usted puede también tener acceso a un espacio gratis en Office Suite. La diferencia más grande es que el software y los documentos de Google doc. están almacenados en Google y alcanzados vía Internet, en vez en de su impulsión dura (hard drive). Usted puede utilizar su identificación del gmail para tener acceso a Google doc. There is an electives course that teaches Google Docs. 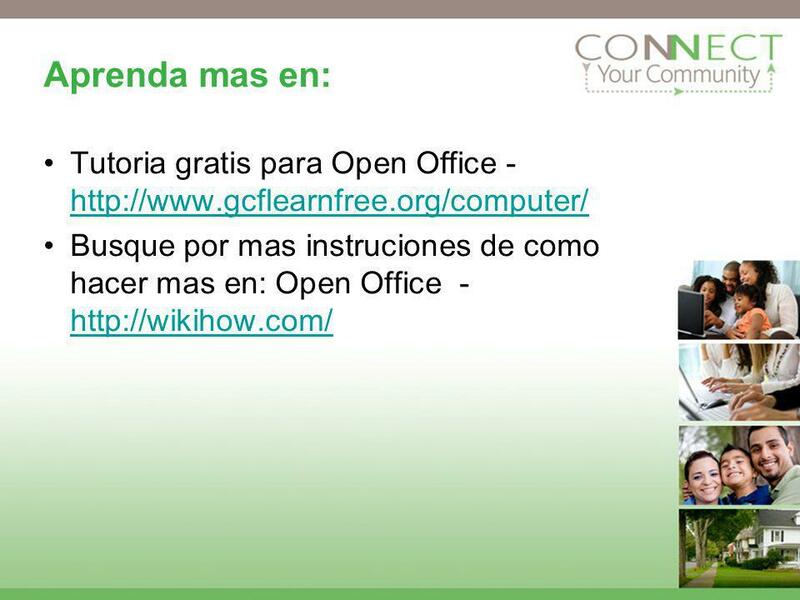 18 Aprenda mas en: Tutoria gratis para Open Office - Busque por mas instruciones de como hacer mas en: Open Office - There is an electives course that teaches Google Docs. 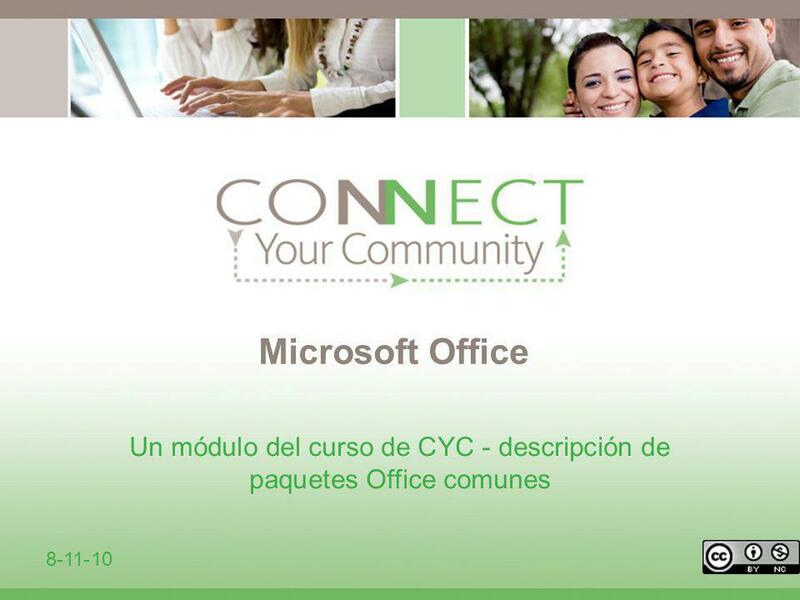 Microsoft Office Word 2007 Procesador de Textos Clase 01. 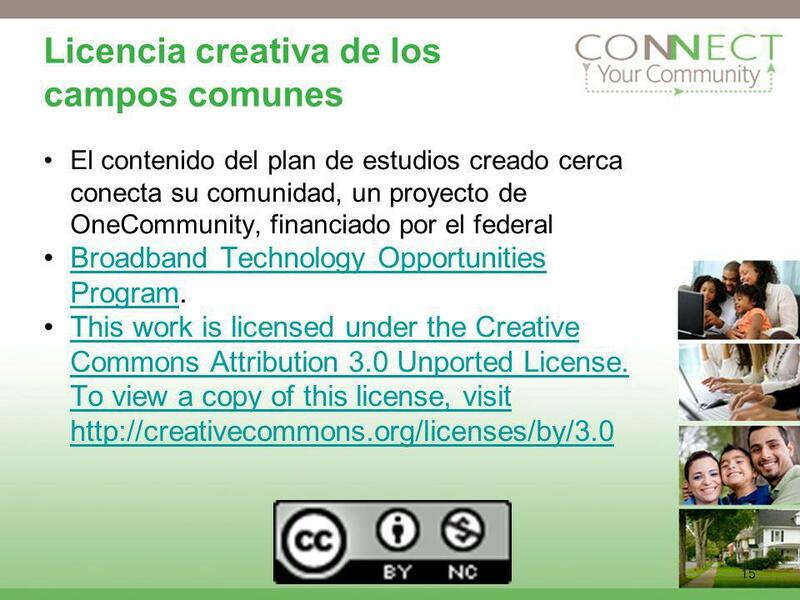 PASOS PARA AGREGAR UN ARCHIVO DENTRO DE ASSIGNMENT.